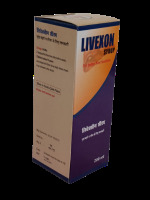 Livexon syrup brings the benefits of livexon capsules in syrup form. Many patients jhesitate or are unable to swallow capsules, for them we offer livexon syrup, which is good in taste and rich in health. It improves liver functioning, bile secretion and biochemical processes in the liver. It is beneficial in all kinds of jaundice. It helps in recovery from hepatitis, alcoholic liver, chronic addictions, liver damage from long term medication intake and other toxin or infection induced injuries to the liver. In people not suffering from jaundice it improves apetite, digestion and rejuvenates the body systems. Given along with allopathic medicines it helps in preventing damage (if any) caused to the liver. Dosage: 2 teaspoonful three time daily before meals In children below 10 years: 1 teaspoonful three times daily before meals.